I've mentioned a few times that while the majority of my cards are done with designs inspired by older baseball card sets I'm a basketball guy at heart. It's just that baseball cards are more nostalgic to me personally as they were more readily available than basketball cards were. My hero growing up was Isiah Thomas. My first born son is named Isiah. It's that serious. 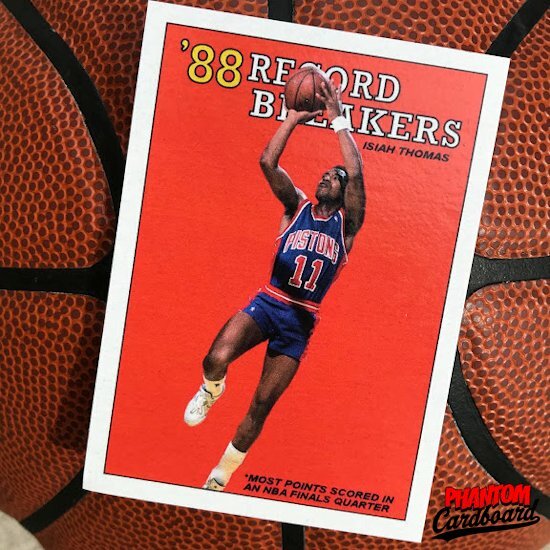 If I could go back in time and change things in the card collecting hobby one would definitely be Topps' hiatus from basketball basketball cards from 1982-83 through 1991-92. If they hadn't there could have possibly been a card commemorating Isiah Thomas' heroic efforts in Game 6 of the 1988 NBA Finals when he scored 25 points in the game's third quarter on an ankle that would have probably seen many of today's stars airlifted right out of the arena. It was one of the greatest things in sports I've ever witnessed. This card is of course modeled after the 1988 Topps baseball Record Breakers subset. For whatever reason I just love doing record breaker cards. The photo used is actually one from that particular game.